car-ol (Karel) v. -oled, -oling, -ols. Also chiefly British -olled, -oling. --tr. If the word CAROL means TO SING JOYOUSLY, TO CELEBRATE IN SONG, then CAROL JOHNSON certainly lives up to her name! For nearly forty years, this uniquely gifted singer-songwriter has delighted, uplifted and sensitized audiences of all ages with her wit, her warmth, her compelling insights and her wonderfully crafted compositions. Her songs sparkle with energy; they encourage us to be good to each other, to ourselves, and to the earth. They celebrate life, and with a healthy bit of humor they also challenge the way we sometimes live it. 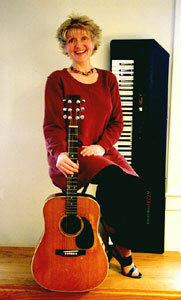 Accompanying herself on guitar, piano and banjo, and with a hearty dose of audience participation, Carol has indeed warmed hearts and lifted spirits of countless thousands through her delightful recordings and personable presentations.